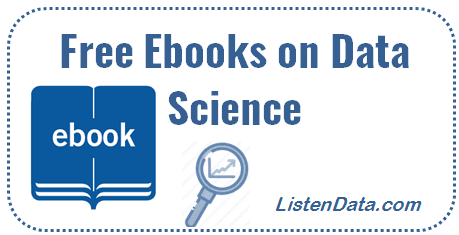 The following is a list of free books (PDFs with data sets and codes) on R programming, Python and data science. Please read the disclaimer about the Free Ebooks in this article at the bottom. It provides a quick and practical guide to just about everything you can do with the open source R language and software environment. You’ll learn how to write R functions and use R packages to help you prepare, visualize, and analyze data. It covers some of the most important modeling and prediction techniques, along with relevant applications. Topics include linear regression, classification, resampling methods, shrinkage approaches, tree-based methods, support vector machines, clustering, and more. It helps you to learn R from the machine learning perspective. It introduces R-Weka package – Weka is another open source software used extensively in academic research. It covers the most popular package of R on graphics ‘ggplot 2’. It covers the package in detail. It covers a variety of situations with examples in the two most popular programming languages for data analysis - R and Python. It is illustrative guide, which will walk you through all the text processing techniques in a step-by-step manner. It will demystify the advanced features of text analysis and text mining. It offers a highly accessible introduction to Natural Language Processing, the field that underpins a variety of language technologies ranging from predictive text and email filtering to automatic summarization and translation. Deepanshu Bhalla or ListenData has no affiliation to either the authors of the books or the web-sites hosting these PDF books shared in this post. We are not responsible for any content on other sites we link to. Most of the PDF links were gathered via Google search results in the first or second page and we assume they are hosted on either the authors' webpages or university sites. Please let me know if you think any PDF link posted is a copyright infringement, I will remove that link. 18 Responses to "Free Ebooks on R, Python and Data Science"
Thank you so much. Awesome. This was timely. I'm looking for some R books to get me started. Thank you. Thank you very much for these learning materials..
Thats a needed post with download links.. Thanks a lot Deepanshu for the collection of most useful books shared with us!! I have read your blog,its really amazing post with smart content.Thanks for sharing your useful article. Can you please mention which file need to download for R date set link..unable to find data set. An ebook is a digital representation of a printed book. One reads an ebook. Not all ebooks are downloadable (though many are), some can only be viewed within a browser, web app or webpage ebooks audiobooks for sale. Here I am telling you the one powerful secret about handling the data complexity, by using the professional team of data scientist everyone can easily solve their problem of data complexity and management, and from here Activewizards blog you can easily get the best data scientist for you. Nice post. I like your blog, I sincerely hope that your blog is a fast-growing traffic density, and to help promote your blog, we hope you blog updates and place can always be colorful. Thanks for sharing this useful content with us. Keep Sharing.